A beautiful love song in the voice of Mitali Mahant featuring her in song video. The video of this song is available on YouTube at the official channel Ampliify Times. This video is of 4 minutes 08 seconds duration. 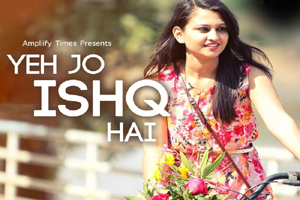 Lyrics of "Yeh Jo Ishq Hai"
Lyrics in Hindi (Unicode) of "ये जो इश्क है"